Is Holiday Classic It's A Wonderful Life Secretly (or Actually) a Sci-Fi/Fantasy Movie? Everyone loves It’s a Wonderful Life, but do we give it the genre credit it’s due? Off the top of your head, name the best sci-fi and fantasy films of all time. Films like 2001: A Space Odyssey, Star Wars, The Lord of the Rings, Blade Runner, Alien, Back to the Future, The Wizard of Oz. You get the idea, right? But one film that rarely, if ever, gets mentioned in that same list is Frank Capra’s iconic 1946 film It’s a Wonderful Life. But why not? After all, it’s a movie about a guy who travels to alternate planes of existence and through time. Yet, so few people think of it in that way. This argument came up a few years ago behind the scenes of this very website when I pitched then-io9 editor Rob Bricken on including It’s a Wonderful Life on some sort of list. He said it didn’t qualify as an io9 movie, I presented him with some evidence, and was eventually just dismissed because he was far too busy. But it stuck with me. How is this not a cut and dry case of genre classification? Hello, you old savings and loan! In my mind, the arguments against It’s a Wonderful Life being a science fiction or fantasy movie are largely cultural. 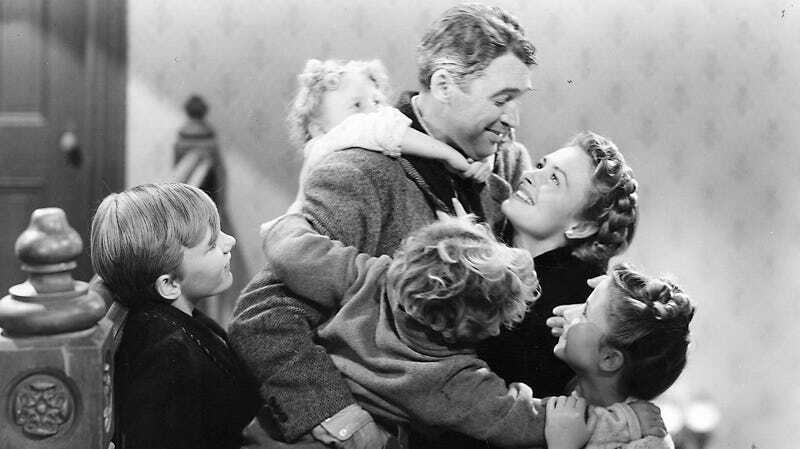 Most people see movies as one thing or another and It’s a Wonderful Life is known as a feel-good holiday movie. Period. It’s the movie NBC airs every year during the holidays. There are no spaceships. No futuristic technology. No creatures. No wild special effects. Okay, but there are talking celestial beings throughout the movie that may or may not be gods. I guess people forget about that? Instead, when you think of It’s a Wonderful Life, you think of a nice, simple, family drama directed by someone who did that better than anyone has or maybe ever will, Frank Capra. You think of its megastar, Jimmy Stewart, charming and charismatic as always. You think of Donna Reed, equally delightful and captivating as well as one of the biggest stars of that era. There are the famous lines of dialogue such as “Every time a bell rings, an angel gets his wings” or the tear-inducing rendition of “Auld Lang Syne” at the end. Or just the character of George Bailey himself, a person who is so wholesome and wonderful that an entire town rallies around him when he needs it most. Who would’ve thought? All this because of this old man in a hat. You forget the movie is also about a suicidal man who is visited by an angel who then grants that man a wish to never have been born, creating an alternate, parallel timeline where George Bailey never existed—just to show him how terrible the world he knows would have been without him in it. A movie where this man sees all this with his own eyes and interacts with people who exist in a timeline and reality completely different from his own. Or, more specifically, maybe you don’t forget about that. It’s just a smaller part of the much larger story and it gets overshadowed a bit. Nevertheless, I get people not considering It’s a Wonderful Life to be a genre film. The movie isn’t about its genre elements, it’s about the human spirit. But those elements are in there, they’re important, and it’s obvious once you spell it out. Mostly, it’s just that Capra’s tone and filmmaking never focus on it. Instead, everything in It’s a Wonderful Life feels real, grounded, simple, and heartwarming. Still, there’s no denying the whole films hinges on an event that could never actually occur, unless created by scientific innovation or mystical beings. Which, my friends, are pretty much the textbook definitions of science fiction and fantasy. Paramount Threatens It&apos;s A Wonderful Life Sequel!